Working in partnership with the people of Atikokan and the surrounding areas, to generate and maintain permanent employment through the creation and support of self-employment initiatives and economic-based community projects. The Atikokan Economic Development Corporation is a non-profit, community based corporation. We are governed by a Board of Directors who are elected at the Annual General Meeting for a three year term. 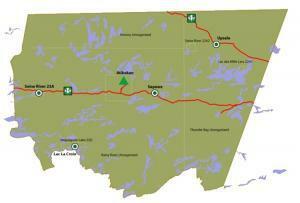 The Atikokan Economic Development Corporation works to promote the community and area. We also work to maintain and recruit business to the community. We offer a number of services including business plan development and community strategic planning, etc. The Atikokan Economic Development Corporation has a service area that includes the town of Atikokan, the village of Upsala, and the First Nations of Seine River, Lac la Croix and Lac des Mille Lacs. General management responsibilities including personnel, financial planning and management, business planning, government relations, technical and advisory services to businesses and organizations. Highlights: Atikokan Chamber of Commerce Ambassador of the Year (2011). Served on Community Future Ontario’s board of directors since 2012 and is currently the President, in addition to serving on the Community Futures Network of Canada (CFNC) Board of Directors. Elected to the Atikokan Township Council in 1988 and was re-elected in each municipal election, until leaving politics in 2003; as a Councillor, he chaired a number of committees, including finance, public works, parks and recreation and cemetery. In 2000, he was elected as President of the Northwestern Ontario Municipal Association (NOMA); as President of NOMA, he served as Vice-President of the Association of Municipalities of Ontario. Garry served 2 years as President of the Northwestern Ontario Development Network, and currently sits on the Northwest Training and Adjustment Board of Directors. Garry has previous volunteer experience with the Royal Canadian Legion, Kiwanis Club and the Atikokan Masonic Lodge. Business planning and counseling, loan disbursal and compliance, CED projects, tourism marketing and promotion, liaison with community groups and organizations. Educational Background: Bachelor of Arts (Carleton University), Certificate in Economic Development (University of Waterloo), Certified Economic Developer (Ec.D), Certified Economic Developer (CEcD), Certified Business Counsellor (APEC). Highlights: Economic Developers Council of Ontario’s (EDCO) Young Professional Influencer of the Year (2015); International Economic Development Council’s (IEDC) Leadership Award for Young Economic Development Professional of the Year (2016); Development Counsellors International’s ‘Top 40 Under 40’ Economic Developers (2017). He has served on EDCO’s board of directors since 2016 and is currently the Treasurer and chair of Finance/Administration/Policy, and is the former chair of its professional development committee. Member of Community Future Ontario’s succession and professional development committees, and past chair of their youth committee. Member Emeritus of the Atikokan Not-For-Profit Daycare Corporation. Created both Tourism Atikokan and the Young Professionals Association of Atikokan. Serves on the steering committee of the Heart of the Continent Partnership, Tourism Northern Ontario’s 13C Advisory Committee, Atikokan Tourism Development Committee and IEDC’s International Advisory Committee. Business planning and counseling, loan disbursal, CED projects, marketing and promotion, liaison with community groups and organizations. Educational Background: Advanced Diploma in Tourism Management (Georgian College), Bachelor of Tourism Management (Thompson Rivers University), Certificate in Economic Development (University of Waterloo). Highlights: Katie is a driving force for Tourism Atikokan, and collaborates with both the NWOSTA (North Western Ontario Snowmobile Trails Association) & Atikokan Sno-Ho tourism initiatives. Additionally, she sits on the Atikokan Charleson Recreation Committee and represents two users groups (Atikokan Sno-Ho & Atikokan Mudslingers). She fills the secretary position on the Atikokan Figure Skating board where she volunteers weekly, and is a member of the Board of Directors for the Friends of White Otter Castle, the Path of the Paddle, the Atikokan Beautification Committee and the Atikokan Tourism Development Committee. Katie has taken on a leadership role with the evolution of the Young Professionals Association of Atikokan. Contract administration, financial record keeping, bookkeeping, loans administration, benefits administration, recording of official minutes. Reception and customer relations, banking, correspondence, record keeping, community information.